The VersionTech G2000 stereo gaming headset is a 3.5 mm headset which was built with the intention of providing a good quality, comfortable sound experience at an affordable price. And this one definitely delivers on that experience. On the outside, you have a professional looking headset. On the inside, you get a decent sound quality on a budget. Gaming headsets have gotten a lot better ever since the starting days of online gaming (Remember that old Xbox 360 headset you had to use?) They add a sense of immersion with a unique sound quality over speakers. They cancel out a ton of outside noise. And they also let you trash talk others online. I’ve never looked back once I invested in a gaming headset. The VersionTech G2000 stereo gaming headset was kind of an impulse buy for me, mostly because I was looking for something to replace my aging Logitech G35 headset. At the same time, I was looking for something that wasn’t going to put me in a pile of debt, as I did when I first started buying expensive gaming hardware. Plus, the LED backlight color pairs well with me desktop gaming PC. If you really want to get the most out of your gaming, you’ll definitely want to invest in a good pair of headphones. Here are a few things to know about the G2000 headset. Is it Compatible with your Console or Computer? Absolutely! One of the main selling points of this product is the massive amount of compatibility with nearly any gaming platform. It has a 3.5mm headphone jack. And we all know that these can plug into pretty much anything! I was able to plug it into my old 5 year old MP3 player with no issue. Since the headset is strictly analog, there’s no need to download any drivers or firmware to make things compatible. This headset looks a lot like the ones you see a lot of the e-Sports gamers rocking while they tear up the competition. It has LED backlights that will light up the ear cups and mic, making you look pretty high-tech. The lights are powered by an additional USB cable. This headset has a lot of cushioning on the ear cups, perhaps even more so than any others out there. It has a memory foam feel to them, soft to the touch. The headrest, just like the ear cups, is made of a synthetic leather material. It also has a retractable headband to adjust to your comfort level. The headphones can be adjusted to fit most heads reasonably well. Keep in mind that the ear cups cannot rotate or swivel like some of the other headsets I have used. Overall, I found this to be a pretty comfy headset. I could play for many hours without feeling uncomfortable. The massive ear cups do a really good job of canceling out any outside noise on their own. Perhaps the best thing that sold me on this headset is the adjustable volume control on the headphone cable. This level of volume is separate from your PC/console/TV, which is very convenient for those who wish to have easy access to muting your game. The microphone that is attached to this headset was probably on of the weaker things I found when using this headset. For starters, it is a solid plastic stick, and cannot be finely adjusted like the other headsets out there. The microphone only moves in one direction, and so the mic can only be used on your left-hand side. That being said, if you prefer to play with the mic on your right, you may want to take a pass on this headset, or not bother with a mic at all. Despite this setback, I have not noticed any distortion or echo while using the mic. Just like the cars we drive, gaming headsets come in all shapes and sizes, and their price tags are no different! The G2000 headset is cheap, no doubt about that. The light-up headset is cool, but only a gimmick for some, otherwise, it does not serve any other purpose. The G2000 headset is priced at $24 on Amazon, when I last checked. I found this to be a pretty good buy. To sum things up, this is not a perfect headset, but it definitely feels like a professional gaming headset without costing an arm and a leg. It is cheaply made, which can be reflected in the price, yet the sound quality is good and clear. 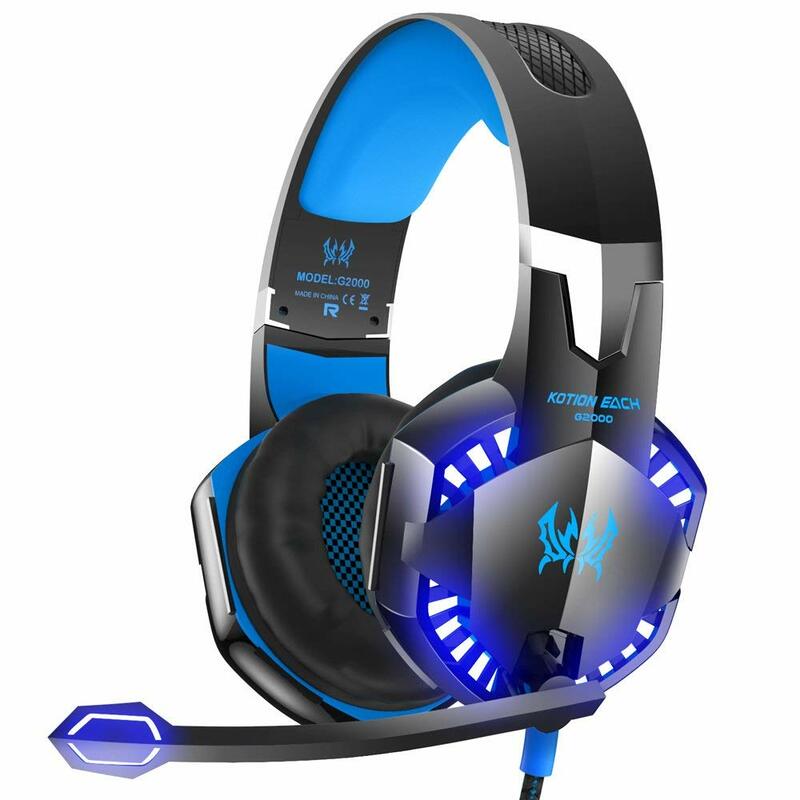 I find that this headset is best for those who would like to get into professional gaming gear without breaking the bank, and based on the almost 2000 positive reviews on Amazon, it’s safe to say that many gamers really enjoy this headset. I hope you have enjoyed my review of the VersionTech G2000 gaming headset. If you have any questions, feedback, or requests, feel free to let me know in the comments below!